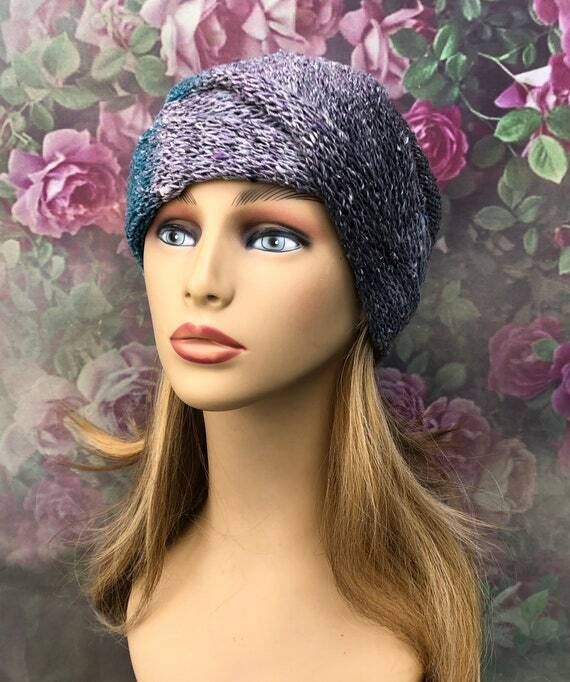 ðºThis light weight beanie hat was knitted in soft yarn made of 20% Silk, 20% Cotton and 60% Polyester. It is decorated with two purple plastic buttons. ðThis yarn has a very slight silk slub feel, and a soft cotton finish. It is very light weight. This hat is made up of aqua, teal, lavender, purple and grey with specks of white throughout. ð·It measures approximately 19" in circumference and stretches to 26" comfortably. It is 9 1/2" deep unfolded. ð¼I make my hats deeper than most, because of this they are perfect for women undergoing chemotherapy. They will cover your head well, and stay on. There are no irritating seams inside, and the yarn is soft.